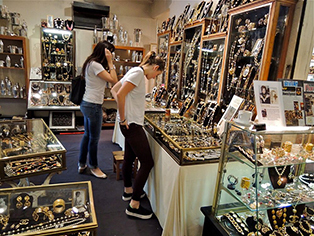 On my first trip to Paris I was most eager to visit the legendary flea-market. Even though it was minus 5 degrees on a freezing morning, I was in heaven browsing this whole village of exquisite antiques, vintage clothing and every conceivable type of bric-a-brac. Then I saw a small store with brilliant feather boas, braids and buttons of every hue glittering in the chill morning. Suddenly all my sleuthing antennae were on high alert. Having spent the morning lusting after super-expensive Chanel and Yves St Laurent costume jewelry from the hey-days of haute couture, I recognized in the drawers before me metal stampings for similar costume jewelry from the Art Nouveau and Art Deco period. The weather was so cold my skin froze to my metal treasures, as I gathered them up to bring back to my workroom and recreate these beautiful designs of a bygone era. Great design never goes out of fashion. Neither does hot chocolate to warm ourselves after a particularly successful shopping expedition!